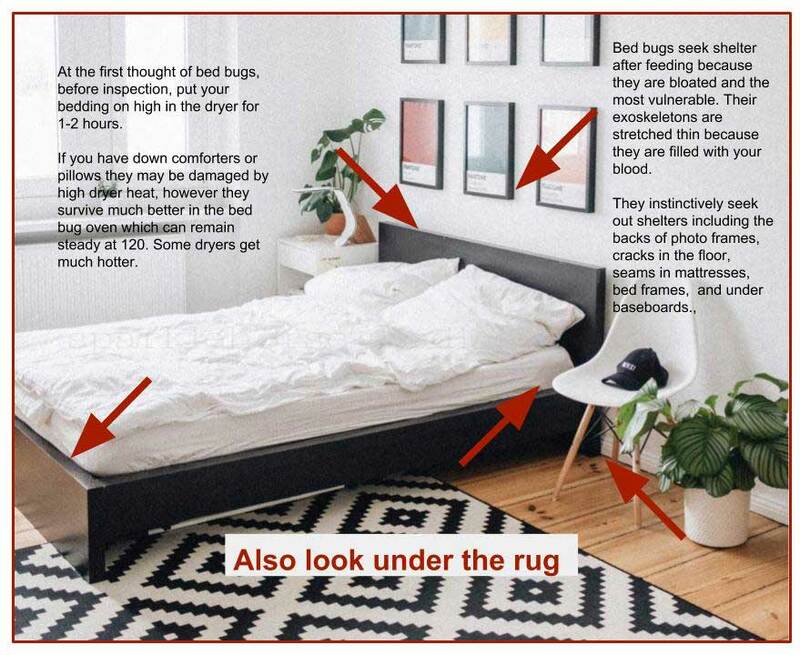 You are here: Home › Bed Bug News › Bed Bug Inspection › Blog › Where to look for bed bugs? Knowing where to look for bed bugs will help you find them faster. You must confirm you have bed bugs before you can treat for them. An inspection done by a professional pest control company is always preferable but you can inspect if you know where to look and what tools you need. A bright flashlight and a lighted magnifier are required to inspect for bed bugs. Bed bug eggs can be as small as a grain of salt. Bed bugs are about the size and color of an apple seed, more or less. Shining a light on a bed bug may cause them to flee or they may stay frozen in place. Be prepared with a way to capture or kill a bed bug if you do see one. For an inspection you can use a spray bottle with 91% alcohol or one of the cedar based bed bug sprays. These sprays are only effective when sprayed directly on a bed bug. They do not provide the residual pesticides needed to kill bed bugs it does not physically make contact with. Residual pesticides spray pesticides contained in microscopic bubbles the bed bugs will walk through after feeding when they are heaviest. Gross, I know. ** That is why you will be instructed to keep sleeping in your bed. You are the bait needed to fatten them up so they can drag their blood filled bellied through the poison to kill them. * heat treatment removes this unsavory commitment.